By Eleanor (Jojo) Hart — born in DRCongo (Zaire) 22 years ago. 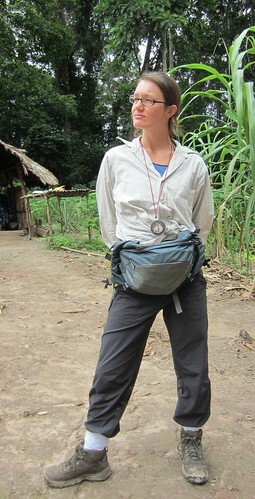 I returned to Congo this September. My friend Andrew Bernard and I, both with newly earned undergraduate degrees, traveled together. 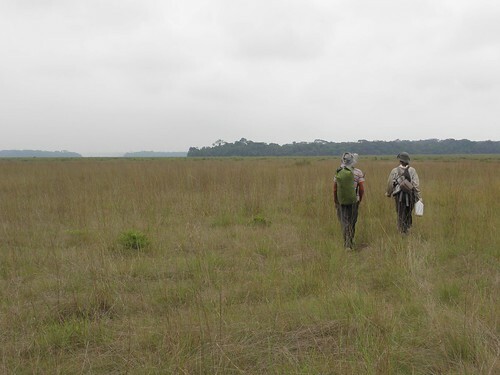 He continued directly to the Lomami Park to spend three months studying birds. Before joining Andrew and my parents I worked first as a substitute teacher at the international school in Kinshasa, my alma mater, then as a volunteer at a missionary hospital, where I observed surgeries and witnessed my first childbirth. 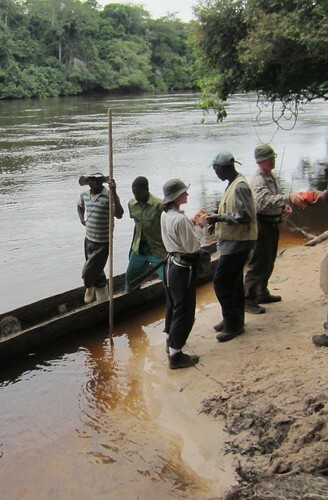 I spent my last month in Congo opening transects in the proposed Lomami Park. Below are observations from that time as I became acquainted with the land, field work, and the remarkable people with whom my parents work. October 28th: After spending a few days in Kisangani where my parents had meetings we flew south along the Congo River to Kindu, a smaller more isolated town than Kisangani and the southern entry into the TL2. 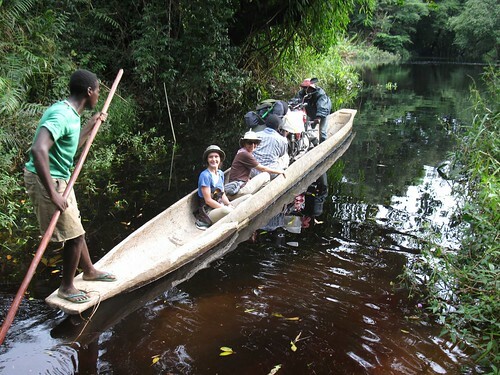 From Kindu it is 5-6 hours on motorbike northwest to Tshombe Kilima, a collection of mud-wattle houses on the eastern edge of the future Lomami National Park. 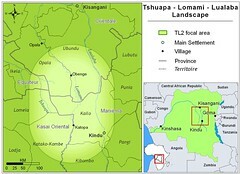 From Tshombe Kilima it is 36 km of hiking, to the village of Katopa on the western edge of the forest. Katopa was my base for the next couple of weeks. Two major themes of my trip to TL2 this year were the importance of suiting up and of the mushasino (or hip-pack), an indispensible article. I had not come prepared with a mushasino, so I used the removable top of my frame pack. Thus, my mushasino was huge and a source of great amusement. During the rainy season, suiting up for a motorbike ride means long sleeves and long pants, a hat and sunglasses with a raincoat easily accessible. It is best to have water, sunscreen, a headlamp and possibly a camera in close reach, for which the mushasino is perfect. The motorbike ride is rough. The trail is narrow and muddy, there is always the possibility that you will get stuck in a rainstorm, or that the bike will fall out of a dugout or off a bridge during a river crossing. Thus, it is critical to properly pack your gear in two heavy-duty plastic bags. Mom and I cross the Kasuku River with Mom’s driver Gilain balancing her motorbike in front. Mama, Baba, Dino and I pulled out of Kindu in the afternoon. For the first half of the trip the weather was fine, but after we crossed the Kasuku River the rain began. Forks of lightening lit up the purple sky as we moved across the savannas, followed closely by booms of thunder. Despite my raincoat I was soon drenched and cold. The uneven dirt path was streaming with runoff, and several times we had to get off the bikes to push them over slick, eroded sections of hill. 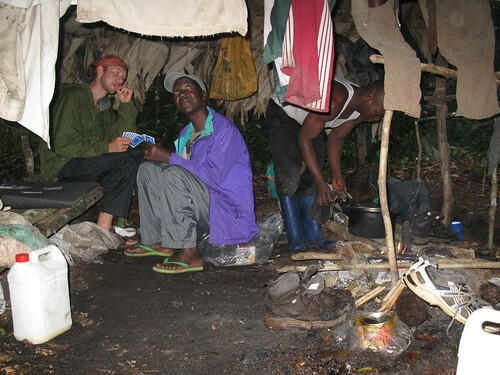 We arrived after dark, wet and cold at Tshombe Kilima– two hours later than expected – and were dismayed to find no fires or food at the project compound. But using headlamps from our mushasinos, within an hour a chicken was killed and plucked for dinner and a blazing fire was built. We huddled around it close to midnight, eating rice and chicken floating in palm oil. November 1: I had my first lesson in GPS before leaving Tshombe Kilima. Over a breakfast of Quaker’s quick oats with powdered milk and sugar, Baba explained elements of geography, using a lumpy lemon as our planet Earth. I had many lessons from Baba on this trip. Here, how to download my GPS and check the trail we cut on a map. He really wasn’t as worried as he looks. By early afternoon I was well suited up for the walk to Katopa– long pants tucked into long socks (to keep ants from crawling up my legs), a hat and a long-sleeved shirt for crossing the savannas and a raincoat around my waist. In the mushasino was sunscreen, camera, peanuts and requisite headlamp. On this walk I began to see important transitions in our surroundings. 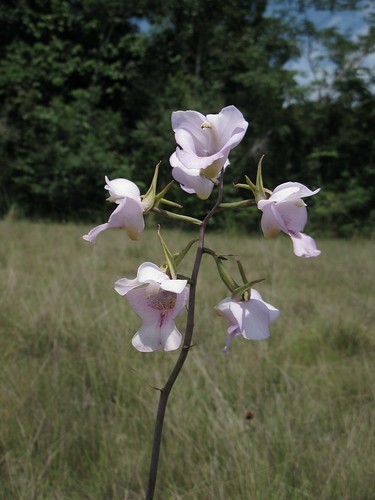 The Lomami park boasts an exceptionally varied landscape: dry forest and flooded forest, swamp and savanna. I learned to pay attention to the soil – Is it sandy or clay like? 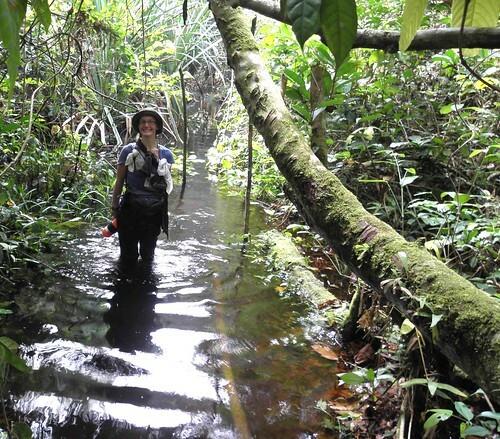 – Also, the height of the water table, the color of the running water, the size of trees and type of understory, and the number of termite mounds and ants present. November 2: Breakfast is tea with lemon, steamed plantains and peanut butter. It is beautiful here. The Katopa base camp is built on the bank of the Lomami River and Baba has planted a big garden. There are tomatoes, manioc, amaranth, several other local greens, pineapple and papaya, with local eggplant and cabbage on the way. I had my first forest session cutting transects. We work as a two-person team. One person in front with a machete cuts the path while someone behind (me) guides the cutter, using a GPS and compass to keep the transect on course. Today I worked with Martin, pointing out landmarks in the distance for him to cut towards. Describing different trees and undergrowth is excellent Swahili practice. This evening I made a map in my field notebook of the region where I will be cutting transects. 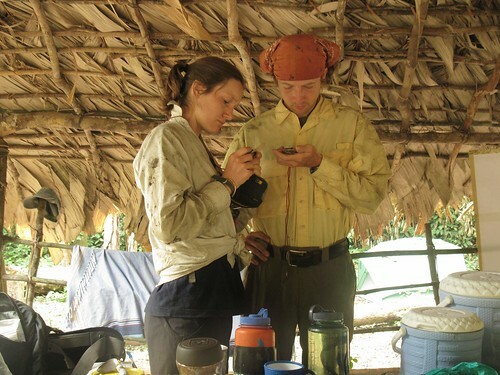 Nov 3,4: More transect work with Martin – still based at our Katopa camp. We move slowly as we cut transects, which gives me a lot of time to just watch the forest. 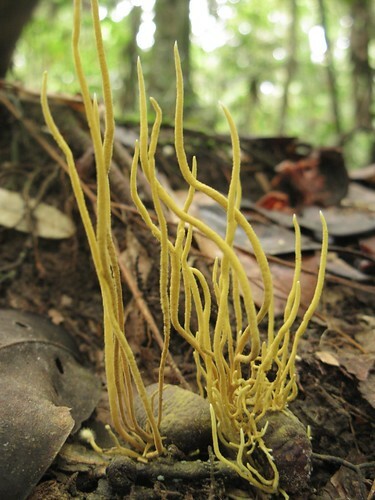 Today we walked through a field of yellow, flame-like mushrooms that grow out of the fallen fruit of a specific tree, and my attention is always drawn to the lianas. They are distinguishable by their shape and the color of their wood and sap. 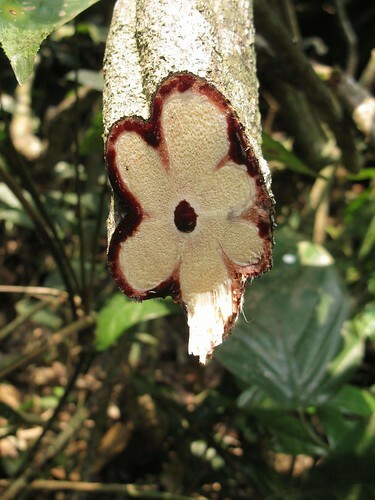 Some lianas have alternating red and pink wood, others have florescent yellow sap that leaks only out of the center, while others bleed a bright red along the rim. Nov 5: I am writing by candlelight from one of two barazzas (leaf-roof shelter) at Camp Bonobo where I will spend my first overnight in the forest. Nearby there is a white-water stream, which is good for drinking, and a black-water stream, which is full of tannins and good for washing. I love spending time in the cooking barazza where there is always a fire going and I can talk with the men who are my work companions. In the eating barazza (here) the interior design leaves something to be desired… The table is too high and too far away from either of the benches –all fixed in the ground. The table is finished with an uneven flattened wood bark, rendering it precarious for mugs of hot tea. Twice, my milky sweet tea tipped over! Dino is the Katopa camp manager and was a huge help. 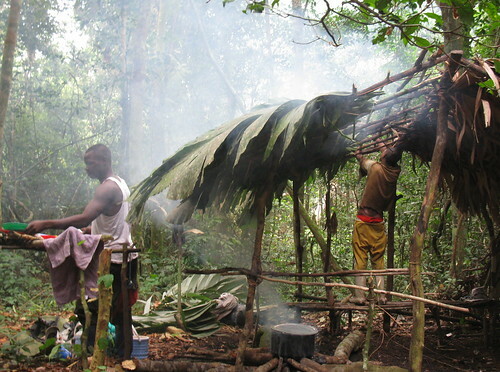 Alas – today as we were getting ready to leave Katopa camp I learned the importance of the mushasino. I took a last trip to the outhouse, a squat-down, hole in the ground affair with a view over the Lomami River, and as I stood up the GPS slipped out of my shirt pocket and down the hole! Baba and Dino responded to my utter dismay and confusion by fashioning a long stick with a hook-like branch on the end. I was able to snag the GPS, using my headlamp to illuminate the hole. Then Baba, Dino and I spent a good twenty minutes on the bank of the Lomami thoroughly cleaning it with tiny twigs, then wet cloths and finally hankies doused in alcohol. The GPS still works, thank goodness, but when it is not in the mushasino it is securely tied with ribbon to a button-hole on my shirt. After the outhouse affair it was a bit of a subdued departure for the field. I am clutching the GPS, Martin is waiting in the pirogue. Martin, Jean, and Bonnie waited patiently. It was late morning when we crossed the Lomami, back to the study area. Martin is average height and strong and usually wears a fantastic sky-blue, floppy, felt hat. 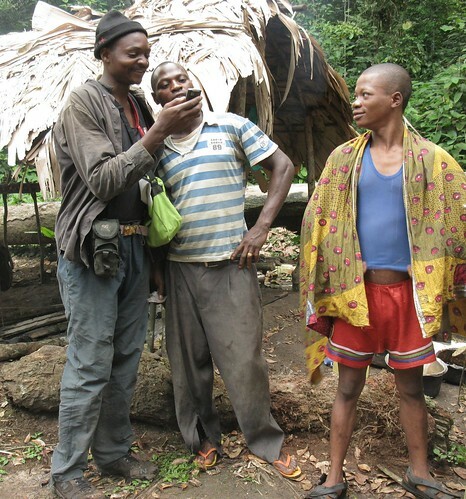 Bonnie is a tall, lanky young man from Katanga province who recently moved to Katopa. His young wife is due to have a baby in a few months! 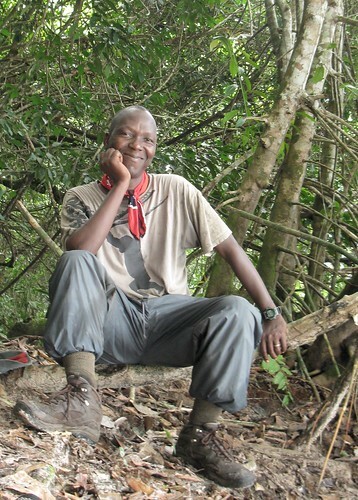 He is a brilliant naturalist and very familiar with the bonobo-rich southern region of the Lomami Park. Jean is small and nimble, visiting his mother, one of the Katopa chief’s four wives. Bonnie (left), Martin and Jean in camp at the end of the day. Martin and I cut more transect this afternoon while Bonnie and Jean walked over 18 km along transects and paths looking for bonobos or signs of bonobos. As Martin and I cut transects we also look for signs of bonobos. So far we have seen old nests, bonobo trails and fresh brutage or signs of eating. Today he and I had our first real conversation as we walked back to Camp Bonobo on the new transect. I asked most of the questions, but his answers were always long and detailed. Martin is in his late 20s. After his first wife left him with five young children he went looking for another wife in a nearby village. Once he paid the bride price (goats, oil, hat and watch to the dad and shoes to the mom), she moved in with him. He says he is now saving up money so that she can go to secondary school. Martin was the oldest son in his family and never had the chance to finish secondary school because it was his responsibility to provide for the family after his father died. Martin and I walk to one of our study area camps. Martin is also an extremely hard and determined worker. Cutting through the forest understory is grueling, but he rarely wants a break, and once we get back to camp he immediately swings into gear cooking dinner. Amazing. I took a bath in the black-water stream near Camp Bonobo tonight. There are crayfish in the stream that pinch you if you bathe after dark. I know it’s silly, but I am scared of the crayfish, which is a great source of amusement to Martin, Jean and Bonnie. Jean caught a few and we ate them with our dinner of rice and dried fish. Nov 6: This morning Martin and I continued work on the transect that we started yesterday while Bonnie and Jean walked 30 km (!) looking for bonobos or signs of bonobos. It was dusk when we got back to Katopa; Andrew was also back from his final foray into the savannas! It was so good to see him. We stayed up until midnight catching up – we had many stories to exchange. Nov 8: Back at Camp Bonobo, this time with Andrew, Dino and the cook Brazzos, and two young fellows I do not yet know – Amigo and Michele. We have three transect cutting crews. It turns out my first transects veered a little too far to the West, so Martin and I corrected them today, finishing at the correct coordinates. This evening everyone sat in the kitchen barazza together around the fire and I had a long discussion with Bonnie and Martin about the bible and evolution. Explaining evolution is a bit of a stretch for my Swahili, but I did my best. Nov 9: More transect work out of Camp Bonobo. Martin and I work really well as a team, and have a rhythm down. We were able to cut 2km of transect today, the most yet, because the forest was relatively open. We ate a lunch of rice and greens and milky tea by a stream on our way back to camp. Retracing one’s steps on a newly cleared transect is a little unnerving, especially if you are moving fast, because it is easy to trip on a low liana and land on a pointed tree stump. Yikes. Nov 10: Walked East to Camp Mpaka today, which was recently burned by poachers angry about the new park. The men quickly swung into gear repairing the two barazzas. With a machete as their only tool they replaced the entire foundation with new tree trunks, lodging the treelets by thrusting them into the ground. They replaced the roofs with fresh leaves, using lianas to attach all the components together. Andrew and I helped as we could. Repairing the kitchen baraza at Camp Mpaka and getting supper underway at the same time. Camp Mpaka is a beautiful spot at the top of a small rise. At the bottom of the hill is a winding black-water stream and there is a savanna a ten-minute walk away. It is my favorite camp yet. After dinner I talked about marriage with the men around the fire. They were shocked to hear that bride price is non-existent in the United States and that women can, for the most part, marry without their parent’s permission. I was appalled to hear them all talk about beating their wives as if it were as normal as going to the grocery store. Soon Papa Dino, Andrew and I were debating with the rest of the men about whether beating one’s wife is acceptable. Nov 12: At around 4:00 this morning I woke to the sound of people moving around outside my tent. All the fellows were awake hauling packs and gear inside tents or under the kitchen barazza (the second barazza did not have a completed roof). The air felt heavy with rain and the wind was picking up. By 4:30 the downpour began, accompanied by thunder and lightning. I was too excited about the storm to fall asleep again. The rain continued until noon. Brazzos had to dig a trench around the kitchen barazza to keep the rain from flooding the floor. Dino, Andrew and I drank tea and played gin rummy, using a sleeping mat as our table. Eventually two of the young men, Amigo and Jean, began to dance in the rain. Stomping out a rhythm, they swayed and turned. Eventually I asked if they would teach me one of the dances. I am being taught the dance. So, among my Katopa lessons are not only the value of suiting up and the need to always have the mushasino slung at my hip, but also an appreciation of a strange new beauty, new friends and a better understanding of life and work in the Lomami Park. 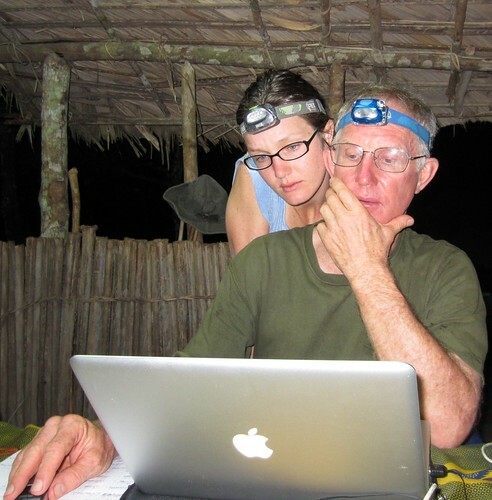 NOTE FROM TERESE HART : The next post will be about transects — the why, where and how. This entry was written by Terese Hart, posted on 2012-01-21 at 11:37 pm, filed under About the project, Guides and how to. Bookmark the permalink. Follow any comments here with the RSS feed for this post. Post a comment or leave a trackback: Trackback URL. Wonderful blog. Thank you so much. I’ve been using John’s Mbuti data for my intro quant methods for more than 30 years… just thought I’d say Hi. Thanks so much for sharing this … it perfectly expresses the joy of discovery deep in the green bonobo heartland!